The Republic of Bulgaria is a country situated in South-East Europe. In the north it borders the Republic of Romania, in the east it ranges to the Black Sea, in the south it neighbours the Republic of Turkey and the Republic of Greece, and in the west it borders (Former Yugoslavian) Republic of Macedonia and Republic of Serbia. State system: a parliamentary republic with a one-chamber parliament (National Assembly), consisting of 240 national representatives, elected for a four-year term of service. The head of state of the republic is the President, elected for a five-year term of service. The Council of Ministers is the main body of executive power. The national flag of the Republic of Bulgaria is in three colours: white, green and red bands, following horizontally from top to bottom. A legend associates the origin of these three colours with the colour symbols of the Old Bulgarian Army. Its left wing was set apart by white strips on the spears, the right one by red, while arranged in the centre were the elite troops with a green strip, the traditional colour of the ruler. The three-colour flag had first been used by the First Bulgarian Legion of Georgi Rakovski (1861). By force of the Turnovo Constitution (1879), the three-colour flag - white, green and red, was confirmed as Bulgaria's national flag. 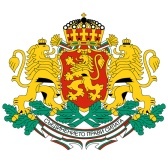 The coat-of-arms of the Republic of Bulgaria is a rampant gold crowned lion against a dark-red background in the form of a shield. Above the shield there is a big crown, whose original shape was that of the crowns of medieval Bulgarian rulers, with five crosses and one other cross, separately, over the crown itself. The shield is supported by two golden crowned rampant lions, facing the shield from the left and right heraldic side. They are standing on two crossed oak tree twigs with acorns. Inscribed in golden letters onto a white strip with a three-colour edging, placed under the shield across the ends of the oak twigs, is Union is Strength. A Thracian tomb, dated to the late 4th-early 3rdcentury B.C. The murals in the burial chamber and in the corridor are of exclusive artistic value. The tomb is located in the Tyulbeto Hill near the town of Kazanluk. A rock monastery compound of the Holy Archangel Michael, with partially preserved churches. The murals in the Church of the Holy Virgin have been described as some of the most significant achievements of 14th century Bulgarian medieval art. The churches are located about 20 km away from the city of Ruse, east of the village of Ivanovo, in the rocks of the Rusenski Lom Nature Park. It has unique murals from 1259, considered among the masterpieces of medieval European painting. It is at a distance of about 8 km from the centre of the city of Sofia (in the Boyana residential district), in the foothills of Mount Vitosha. A rock relief, cut into the Madara rocks on the northern slope of the Provadiisko Plateau at a height of 23 m. This is the most significant monumental piece of art from the early Middle Ages, unique of its kind in European cultural history. It is close to the village of Madara, about 16 km away from the city of Shumen. The most impressive monastery compound in Bulgaria of exceptional architectural and artistic merits. Founded in the 10th century, rebuilt in the 13th-14th century, a literary centre in the 15th century and completed in its present-day striking appearance during the 19thcentury. A spiritual centre of the Bulgarian people, it is located in the northwest part of the Rila Mountain, about 20 km from the town of Rila and about 120 km from Sofia. An architectural, historical and archaeological reserve at the Black Sea coast with valuable archaeological relics from different periods, original churches from the 5th to the 17th century and authentic National Revival Period houses. A Thracian tomb from the first half of the 3rd century B.C. The central burial chamber has exceptionally lavish decoration and impressive caryatides in high relief. It is located close to the village of Sveshtari, 7 km northwest of the town of Isperih. A biosphere reserve in the valley of the Danube, including the Sreburna Lake and its surroundings. It has been established for the preservation of rare plant and animal species. It is 16 km west of the town of Silistra. It is part of the scenic Pirin Mountain. Located in the high parts of the Northern Mount Pirin, it is characterized by a specific relief and an inimitable plant and animal world. It also incorporates the Bayuvi Dupki - Dzhindzhiritsa Biosphere Reserve and the Yulen Reserve.